The Attack On Titan previews keep rolling in, and some of the potential combos shown by the Scout Regiment on the Panini Games blog are certainly catching attention. In the first two sets of MetaX, healing VP has been something that isn’t focused on when it comes to deck building. You might have found a use for the odd Doctor Fate in decks that used Rank 7 special cards or you could have swapped the VP using Slight of Hand, but otherwise when you’ve taken a VP you had to chalk it up as a lost card. But now there are some nice Attack On Titan cards that bring the strategy a little closer to mainstream. Machinations comes at a cost that is creeping towards the higher end of the scale for Events, but it allows you to directly reduce one of your opponents VP, and puts that card into your discard pile which can be a handy place to fetch cards from with other effects. 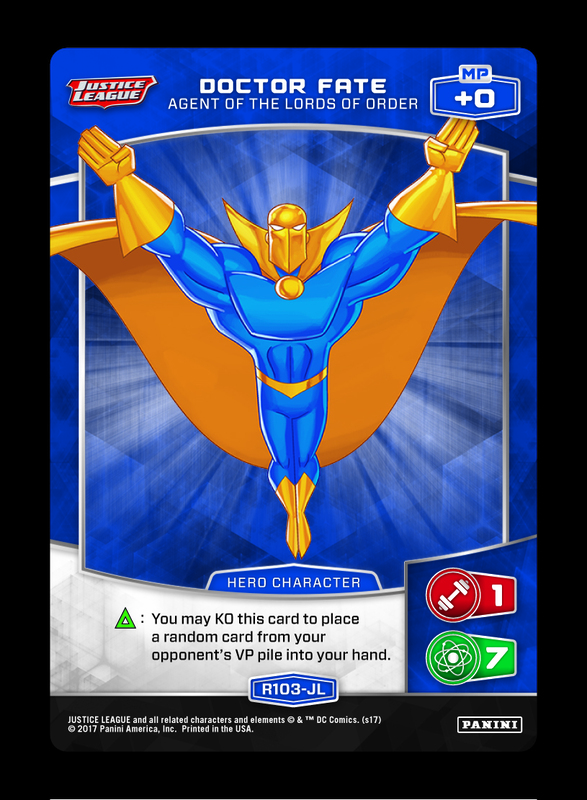 It also means that you need to max out your rank 7 intelligence cards in deck, so you’ll have to be looking at characters like Batman and Lex Luther from Justice League, or Black Hand and Atom from Green Lantern. But there are some nice Intelligence 7 battle cards to choose from. Like this new one from Attack On Titan. It’s low cost is a huge plus, but you do need to be using the card defensively to gain its benefit. The effect can be quite handy for more control type builds that might lean on healing VP strategies, by allowing you to clear one of the defenders your opponent has ear marked for your next turn. So teamed with Machinations, you could get a nice 2 VP swing in two turns. Another Rank 7 Battle card that you could add to this strategy could be this Special 7 as well. At a cost of 5 MP, it matches Machinations for the same outcome. But being a Rank 7 Battle Card you have the added bonus that it is going to KO the vast majority of characters you block with it. Batman UR from Justice League becomes the most ideal character if you are going to be using these cards in an overall strategy. So don’t let your opponents VP get you down anymore. If you’re keen to get them a little disheartened in a match, healing your VP has become a little more attainable once Attack On Titan releases later this month. Check out more previews again over the coming days. Attack On Titan previews are flying thick and fast at the moment, with the new release only three weeks away. There have been a lot of the shows main antagonists, the Titans. While their effects and stats are quite powerful, they lack that little something extra to help them to be more consistent against decks that actively look to punish their plans. Superboy-Prime offers a lot to assist your Titan based deck. His stats compliment a lot of the Titan’s available battle cards, as well as offering some nice resilience by having three stats. He can assist in MP generation as well which can be a Titan deck’s downfall. But the main thing that gives this card value when played with Titans is his effect. At the start of each of your turn’s you can make him a Titan for card effects, which comes in handy for things like Devour, and other Titan stamped card effects. But stopping your opponent from searching their deck is the one thing that sets this card apart when adding to a Titan deck. Coming into Attack On Titan, there are a lot of “toolbox” effects, adding onto an already solid pool of effects like Leap Into Action, Passion for the Hunt, and more. While he may be an Ultra Rare card, he is certainly worth the investment, as he can look to supplement many other strategies as well. Check back again tomorrow as we take a look at more Attack On Titan previews!